Cherif Diarra, 6-4, Forward, John Bowne High School, Class of 2020 - Diarra has the college ball-worthy abilty to can shoot from long range. Good at making smooth moves to the basket. Defensively he has good hands and make and can challenge as a shot blocker. Has good movement and is always alert on defense. 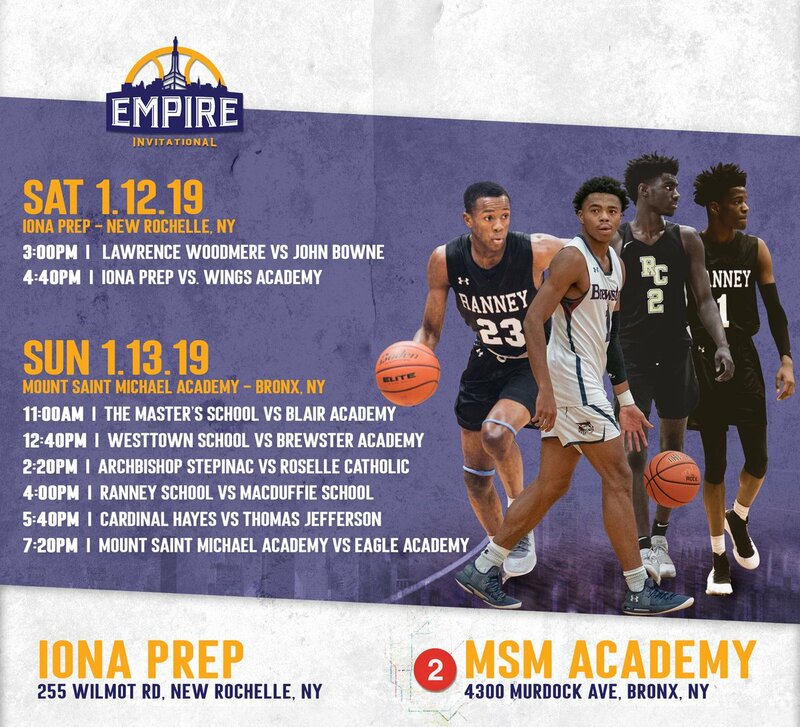 Aidan Igheion, 6-10, Center, Lawrence Woodmere Academy, Class of 2019 - Igheion is NBA-body type physical specimen and is an enforcer in the paint. He is great at protecting the paint area and boxing out for rebounds. Has a great motor and is aggressive on both ends of the court. He will go to college for free. Maurice Butler, 5-9, Point Guard, Lawrence Woodmere Academy, Class of 2021 - Butler is dynamic mover on the court. He knows where to be on defense, jumping into the lanes and pressuring the ball. Offensively, he masks his lack of height by using good deceptiveness when going to the basket. Tyrese Apple, 6-1, Point Guard, John Bowne High School, Class of 2019 - Apple is a quickand deceptive guard who can get to the basket and can absorb physical contact when going up to score. That is key in getting him to the line. He is also good at facilitating the offense and getting assists to his teammates. Aguibou Balde, 6-4, Forward, John Bowne High School, Class of 2021 - This is a solid post player that moves well in the low post. Great at using his body to create scoring space. He attacks the boards with precision and finds ways to get blocks. Has great hands on defense and is very mobile. If he invests in developing an outside game, he would be a natch-up problem at the next level. Jack Shannon, 6-8, Forward, Iona Preparatory School, Class of 2019 - A solid forward who can step out and shoot and is very visible on the low block. Great at crashing the boards and attacking the post. Is a solid post player, and has good hands on defense. R.J. Greene, 6-4, Forward, Iona Preparatory School, Class of 2022 - A guard that who can run the floor and attack the basket. Good at shooting from long range and has good awareness and court vision. A player that plays wise beyond his years. Derrick Crothers, 6-1, Shooting Guard, Wings Academy, Class of 2019 - Crothers can shoot from long range and can find multiple ways to score. A high volume shooter who struggles with shot selection, but is able to absorb contact when going into the lane and is solid at getting to the free-throw line. Mahamadou Nimaga, 6-1, Point Guard, Wings Academy, Class of 2019 - Nimaga is great at slicing and dicing through the lane. Has plenty of explosiveness and shows the ability to score. A player that can carry his team offensively. Tommy Thomas, 6-4, Forward, Wings Academy, Class of 2019 - Thomas is an undersized forward who can do damage on the inside and outside. He is solid at blocking shots and getting rebounds. He steps out to shoot long three-pointers, which will help his chances at the next level. He shows plenty of explosion in his game when he goes to the rim. Matt Brand, 6-0, Shooting Guard, Archbishop Stepinac High School, Class of 2020 - Brand can shoot from long range and can be deadly when left open. He gives his team plenty of effort when he’s on the court. R.J. Davis, 6-0, Point Guard, Archbishop Stepinac High School, Class of 2020 - Davis has great court vision and has plenty of awareness when it comes to finding his teammates. Shows the ability to penetrate into the lane and can also shoot from long range. Possibly the most prolific 6 footer in the region. Jaquan Lynch, 6-0, Point Guard, Thomas Jefferson High School, Class of 2021 - Lynch has good court vision, knows how to‘move around on offense without the ball. He is good at getting rebounds and getting up the court. Can be a streaky shooter from long range, but is great at finishing at the basket. Jalen Smith, 5-9, Point Guard, Cardinal Hayes High School, Class of 2020 - Smith has good hands on defense is alert in going for steals. He takes pride in locking up the opposition on offense. He is lightning-quick when getting up and down the court. Shemani Fuller, 6-7, Forward, Cardinal Hayes High School, Class of 2020 - Fuller is a forward that is very versatile, as he can put the ball on the floor. Good at getting to the rim and using his length to seal his defender. He is a force in the low post as far as getting blocks in the paint. If he adds the long ball to his offense, he could be an All Conference vote getter at the collegiate level. Adam Cisse, 6-8, Forward, Cardinal Hayes High School, Class of 2019 - Cisse plays like a classic big man. Has good timing for blocking shots. Attacks the glass for rebounds and is an force on offense when it comes to the paint area. Kareem Welch, 6-1, Shooting Guard, Thomas Jefferson High School, Class of 2019 - Welch shoots at a high volume, and he demonstrates the ability to shoot from plenty of spaces around the court. His production helps get his teammates open, and he makes the assist when that happens. Despite his small frame, he is great at crashing the boards for rebounds. Ibrahim Wattara, 6-5, Forward, Mount St. Michael Academy, Class of 2020 - Wattara is short for a next-level forward, but is otherwise a physical specimen. He uses his strength to power his way through the lane. He shows athleticism on defense by blocking shots and on offense by getting to the rim for dunks. If he invests the requisite couple of hundred hours in the practice gym to add the long ball, and he could be an impactful swing man at the next level. Vernon Simmons, 6-3, Shooting Guard, Eagle Academy, Class of 2020 - Simmons has plenty of athleticism and shows that he has a knack for scoring. He gets to the basket proficiently by going through the lane and finishing at the basket. DaMarco Watson, 6-3, Point Guard, Eagle Academy, Class of 2020 - Watson is a potent offensive threat for his team. He looks to score all the time, but struggles with turning the ball over at times. Great at moving around on defense and smothering the opposition into giving up the ball.